I’ve got a super busy morning! I’m playing tennis at 8:00, then volunteering at school, then going to the dentist, running by the grocery store, then walking my dog. I’ll even try to squeeze in a little house work when I get home (as if!). My outfit needs to be versatile, casual and easy! I could run around town looking like the old me (on the right), but this is just awful! My bright white tennis shoes are glaring. The loose, baggy track pants are unflattering and the plain black fleece is dull. On the left is my re-worked look. This jacket is actually part of my tennis team uniform, so after my match today, I’ll switch out my tennis skirt for these cute cropped jeans. 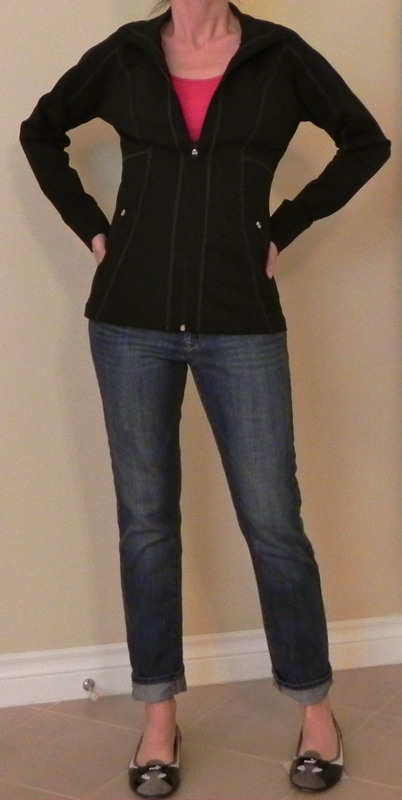 The fitted style of this jacket is much more flattering than the fleece. And the red tank peeking out from underneath adds some color and interest. As for my shoes- I’ve replaced my bright white shoes for my comfy Pumas. I’m now ready to run into someone I know and not be totally embarrassed. This may not be my cutest outfit- but it’s perfect for my crazy day. Love these Pumas- they are so comfy and so much cuter than the bright white shoes. Finally went to order those Puma flats and the blue is on sale at Nordstrom! Scooped up a pair for myself (lets hope they are true to size) and thought I would share the good fortune. Maybe would have preferred the black, but can’t argue with 50% off. Good to know- thanks for sharing! I love that you show what the old you would have worn. Helps me make sure I don’t make those mistakes! Thanks! I think it helps me too! Just seeing how bad some things look on camera remind me to never try them again! Also- I love looking at before and after pictures in magazines, so I think it’s fun to create my own. Lovin the pumas as well ! That is cute, and exactly how I would like to look — casual but pulled together. Thanks for the inspiration!